Jesus replied, "A person who has bathed all over does not need to wash, except for the feet, to be entirely clean. And you disciples are clean, but not all of you." For Jesus knew who would betray him. That is what he meant when he said, "Not all of you are clean." 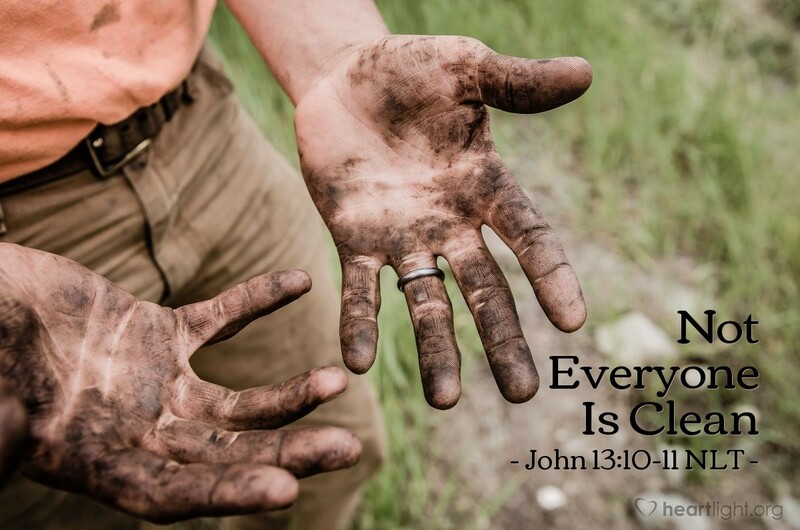 Jesus can clean the disciples' dirty feet, but they have to offer their hearts for him to clean them truly. Judas' heart was dirtier than his feet. Jesus gave Judas this moment to receive his Master's loving service. Judas had to choose to stick to his betrayal scheme or be touched by the Savior. He chose not to be touched by Jesus' love, example, and service. What about you, have you been touched? Have you offered your heart to Jesus? Father, be with me as I seek to serve the following people: ... Please bless my service and use it to draw them closer to your Son. In Jesus' name, I pray. Amen.